What is Detroit Bold's Million Bag March About Anyway? 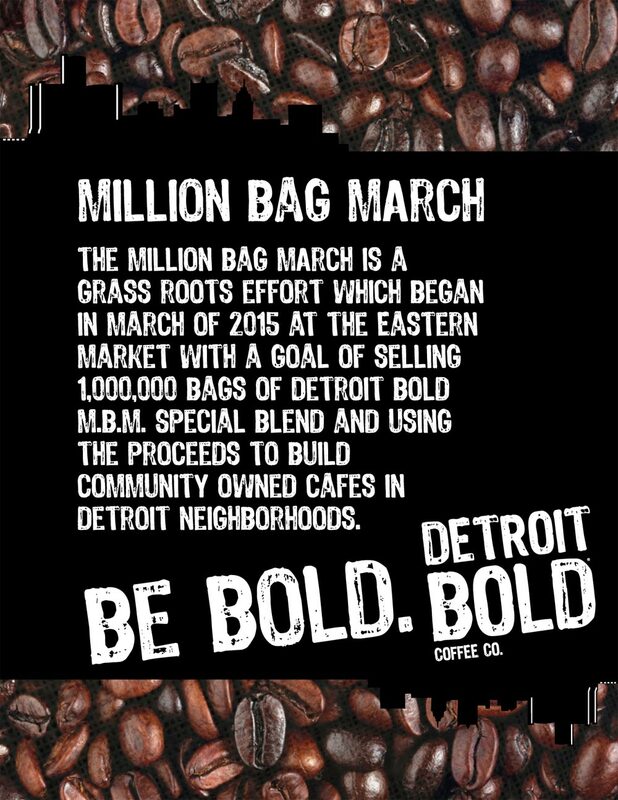 - Detroit Bold Coffee Co.
What is Detroit Bold’s Million Bag March About Anyway? The other day Brett asked me whether we should describe our efforts – to use the proceeds from the sale of our Special Roast build a community-owned café in a Detroit neighborhood= as contributing to the building of Detroit or the rebuilding of Detroit. Its a fair question. My answer is neither. In my opinion, Detroit is marvelously evolving as the ground zero, of what can happen when economic decisions are made that threaten to eliminate the backbone of what makes the great cities of United States of America tick. In many ways, Detroit is the poster child of the Main Street economy. Wall Street’s survival depends on dividends, speculations, futures and currency values, where profit is measured not by where something gets built but how inexpensively it gets built. If something gets produced -under different rules and standards- for less elsewhere, factory locations, and thus Main Street can become nothing more than collateral damage to cost cutting decisions in corporate boardrooms. To an extent, Detroit and its massive automobile and manufacturing center have always been- and always are- negotiable. Add that technological advancements and competition, all hallmarks of an ever evolving marketplace and shifts should always be expected. But the bottom line is this: Detroit grew up on the 5$ a day wage over 100 years ago because people made a fair enough wage to be able to settle and build a community. That community prospered and grew because for the most part, the working population could buy what they built and build what they buy. That was the vision of auto pioneers who saw the benefit of local tool and die shops, plating factories, assembly line plants and so on. These local small businesses fueled other small businesses and fed the larger industry. This cross-trickle, not trickle-down economics helped Detroit grow far beyond its borders and resulted in it becoming one of the most beautiful cities in the world. So when a company decides to invest millions to clear land, build a factory and hire locals -under different rules and regulations-at a fraction of the costs, this initial investment can be recouped and reap an enormous savings. At first, it may seem like a good idea. But the realization eventually sets in that the displaced workers left behind are no longer potential customers and are no longer as viable a part of the consumer market. Under this scenario as time goes by, the marketplace erodes too much and becomes unsustainable because the monetary exchange of commerce can not reach its potential. A correction is inevitable. The Million Bag March seeks to help tilt the scale back to these communities, who, through shifts in economic policies that they had nothing to do with found their neighborhoods ripped apart. We are, each one of us with every bag of Detroit Bold-Million Bag March coffee we buy, ponying up the money to build a local, community-owned café that will serve as a safe and secure place to commune-converse and create. A place to serve as an anchor which can be a hub for learning how to operate a café and more. A Main Street investment in Detroit neighborhoods that need it, and beyond. So thank you for joining the Million Bag March. We appreciate everyone!